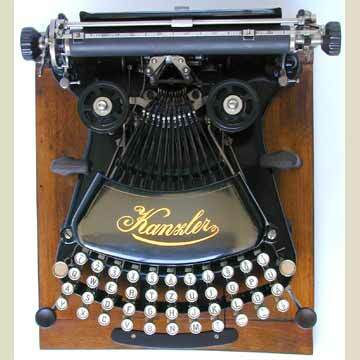 The Kanzler is the most 'German' typewriter ever produced in Germany. Not only the sturdy looks are German, but also the unique combination of swing and thrust action of this machine, and the fact that it only had 11 type bars to print a total of 88 characters. The Kanzler was designed by Paul Gruetzmann, who wished to produce a machine that was not only more stable than other typewriters, but also faster. Once the Kanzler was on the market, the company claimed that a speed of 20 characters per second (1200 per minute, or about 200 words per minute) was technically possible. The top view of the machine (pic 1) shows that the keys were arranged in straight lines, one after the other, each four sharing a type bar. Picture 6 shows the combination of levers that give the type a relatively high speed and strong thrust, even over the short distance between the type and the platen. Actually, Kanzler boasted that the thrust of the type was so strong, that this was the best typewriter in the world for manifolding. There were several models of the Kanzler. The model presented here is known as the Kanzler 1b, because it has two shift keys on either side of the keyboard. The Kanzler 1 only had one. The Kanzler 1 and 1b are much smaller than later models. The last, and largest model was the Kanzler 4 that appeared in 1910. The company folded in 1912. Read more in the book TYPEWRITER, page 172.